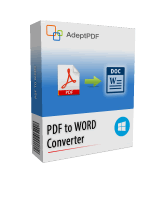 Adept PDF to Word Converter 3.70 was available as a giveaway on March 20, 2017! 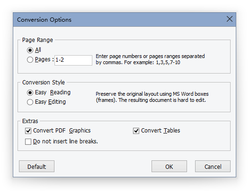 How would you improve Adept PDF to Word Converter 3.70? Simple & easy to use w/ WIN7 x 64 Ulimate. Made exact & editable copy of a text w/ images document. This is a keeper. As a bonus, I was happy to see that downloading is now back to the easy single button action. No links or having to recommend on Social 'Narcissistic' media. I found Libre Office deals better with importing PDF files and editing them. I Installed it on Windows 7(x64), Its iterface is Nice and easy to understand. It converts English PDF's with no issues but when it comes to Persian(Farsi) or Arabic the resaults are terrible. not a single word is readable. OneKey PDF Convertor, which was also a Giveaway in GOTD does Much better and Converts Persian and Arabic PDF's With no Issues. But the Interface on This program is better. I Installed it on Windows 7(x64), Its iterface is Nice and easy to understand. It converts English PDF's with no issues but when it comes to Persian(Farsi) or Arabic the resaults are terrible. not a single word is readable. OneKey PDF Convertor, which was also a Giveaway in GOTD does Much better and Converts Persian and Arabic PDF's With no Issues. But the Interface on This program is better. The program did an excellent job converting an old PDF menu to a .doc file visible in Word 2000. There was a lot of successful formatting, looked fine. This is a keeper. Thanks, GAOTD! The program did an excellent job converting an old PDF menu to a .doc file visible in Word 2000. There was a lot of successful formatting, looked fine. This is a keeper. Thanks, GAOTD! Downloaded into XP. No problems. Tried a few different scenarios. Took a pdf'd invoice at work- perfectly editable. Did the same for a PDF book. (Sometimes I like to keep a page of quotes- works great!) Worked fine with another couple of standard PDFs with images. It distinguished between the image and the text. The big test was a page from a newspaper with pictures and text in newspaper-type columns. It weirdly writes the text boxes over images of the text and offsets it a little- so it looks doubled. (BTW- mispelled a headline- double became doiible.) Each line of text is it's own box. But you can copy a whole article by dragging the mouse over it. After a few failures learned that you have to paste as "unformatted text." The format is a little weird- like a poem- but you can edit it into whatever you want. Don't know why others were having a problem, but with all this can do I think it is a GREAT program. Thank you Adept and GOTD. One of the best and most useful programs I've seen lately! Downloaded into XP. No problems. Tried a few different scenarios. Took a pdf'd invoice at work- perfectly editable. Did the same for a PDF book. (Sometimes I like to keep a page of quotes- works great!) Worked fine with another couple of standard PDFs with images. It distinguished between the image and the text. The big test was a page from a newspaper with pictures and text in newspaper-type columns. It weirdly writes the text boxes over images of the text and offsets it a little- so it looks doubled. (BTW- mispelled a headline- double became doiible.) Each line of text is it's own box. But you can copy a whole article by dragging the mouse over it. After a few failures learned that you have to paste as "unformatted text." The format is a little weird- like a poem- but you can edit it into whatever you want. Don't know why others were having a problem, but with all this can do I think it is a GREAT program. Thank you Adept and GOTD. One of the best and most useful programs I've seen lately! The program creates Hebrew DOC files reversed. Not very useful for this purpose; I imagine it does the same for all right-to-left languages. 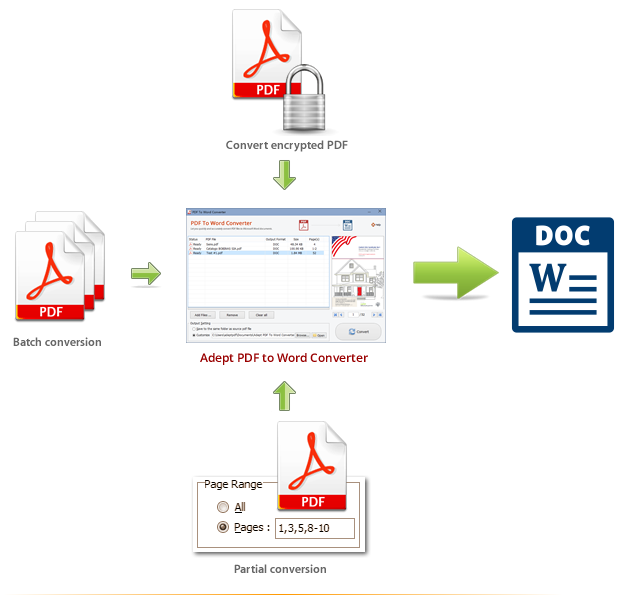 I'm still looking for a PDF to Word converter program which has Optical Character Recognition. Google Books images their book pages making it impossible to search for words or names. I'm still looking for a PDF to Word converter program which has <bold>Optical Character Recognition</bold>. <italic>Google Books</italic> images their book pages making it impossible to search for words or names. I just installed and tested the program. This is what I found. If the PDF file has actual text that can be copied and pasted then this program works as expected. 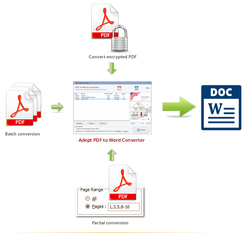 If the PDF file is actual an image of text (were the text was converted to graphics when the PDF file was created), then you will end up with an image in the resulting Word Doc. This program does NOT do OCR - the ability to edit the Word doc is entirely dependent upon how the original PDF was created. The only time this software is worth using is when the PDF file is of the first type described above AND you want the resulting format as close to the original as possible. I will not not keeping the program as 90% of the time my situation doesn't match the limited usefulness as described above. I'm happy to say the program converted a pdf file preserving all hyperlinks ! Word 2007 in compatibility mode could save the file as docx reducing it's size significantly. Although "Adept PDF to Word" doesn't seem to need MS Word or MS Office to be installed the file couldn't be opened properly using Atlantis. Maybe some of the other alternatives to MS Office can,so please let me know. I'm happy to say the program converted a pdf file <b>preserving all hyperlinks</b> ! (I noticed Word 2003 had to convert the newly created doc file to able to open it) Word 2007 in compatibility mode could save the file as docx reducing it's size significantly. Although "Adept PDF to Word" doesn't seem to need MS Word or MS Office to be installed the file couldn't be opened properly using Atlantis. Maybe some of the other alternatives to MS Office can,so please let me know. Take care. Using Win10 64-bit. Gave it a try and the result was unacceptable. The original text was "underneath" the created text and the graphics didn't line up correctly. The end result was not usable. I tested against three files, including a 275 page User's Manual with lots of text, pictures and formatting. This performed better than any other PDF converter I've used and was near perfect. It worked particularly well on an original Will that I'd spend considerable time cleaning up using a different converter. Highly recommend. Installed on WIndows 8 64 bit OS. In the multiple times (at least five) I've tried to use the 'Share on Facebook' option to download different files, it's failed and have had to use the 'email personal link' option. Might explain why the comments section is a fraction of what it used to be. I tested against three files, including a 275 page User's Manual with lots of text, pictures and formatting. 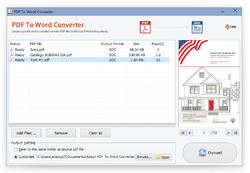 This performed better than any other PDF converter I've used and was near perfect. It worked particularly well on an original Will that I'd spend considerable time cleaning up using a different converter. Highly recommend. Installed on WIndows 8 64 bit OS. In the multiple times (at least five) I've tried to use the 'Share on Facebook' option to download different files, it's failed and have had to use the 'email personal link' option. Might explain why the comments section is a fraction of what it used to be. Installed without problems on Windows 10 Pro and registered cleanly. My first test was on a PDF of a web site page (Banking transaction) created with Cute PDF Writer which I've used for years. The original is perfect, but the conversion results with Adept PDF on both settings were disappointing. Text was quite blurry and looked more like a JPG than text. OK as a rough record but not what I'd call "clean" at all. The second test was much better. I used a 5 page sample from a printer user's manual and it came out very well, good clean text and graphics. More like what I was expecting. Based on the second test I will keep the program. It will come in handy for occasional use. Thank you Adept and GOTD! Installed without problems on Windows 10 Pro and registered cleanly. My first test was on a PDF of a web site page (Banking transaction) created with Cute PDF Writer which I've used for years. The original is perfect, but the conversion results with Adept PDF on both settings were disappointing. Text was quite blurry and looked more like a JPG than text. OK as a rough record but not what I'd call "clean" at all. The second test was much better. I used a 5 page sample from a printer user's manual and it came out very well, good clean text and graphics. More like what I was expecting. Based on the second test I will keep the program. It will come in handy for occasional use. Thank you Adept and GOTD! Quick and easy download, install and activation. Unknown developer of obfuscated location. Weird off-putting EULA which unsuccessfully rewrites that belonging to an entirely different software last heard of back in Win95 days. The question inevitably arises as to if this offering is actually a re-badged product from a different developer. Tested on four different files, two of them originally prepared by the test computer, two of them commercial downloads from commercial websites. Of the two pdf files downloaded from commercial websites, conversion was 100% accurate but, again, editing a hassle. Text boxes needed re-sizing to contend with line bounce; boundaries often remained quirkily impervious to adjustment with the result that text finished up being written on top of existing text in unintelligible outcome. It was noticeable that in one pdf file -- of a 12-page brochure -- text editing resulted in entire lines whiting out, including text lines that had not been subject to revision anyway. The only way to determine if editing had been successful was to scroll further through the .doc then reverse to allow refreshing. As pdfs (most often in a commercial environment) can be marked up / edited with expensive Adobe software, the need for pdf to Word conversion is pretty minimal. At home, where such software is unlikely to figure in the average user's programs armory, then yes, there's a place for it. This software, however, though it impresses - generally -- with its conversion capabilities, didn't impress on test with post-conversion tasks. One caveat does need to be born in mind though: this kind of conversion work is considerably more complex than might appear on the surface. The processes involved are capricious in that what they result in on one computer may not necessarily be what they result in on another: a computer's individual configuration can affect the outcome. In my case, I need -- though very infrequently -- to convert a pdf file for the purposes of editing, not for the purposes of merely converting it, sitting back, and looking at it. On that basis then, thanks GOTD and thanks to today's developer, but this isn't for me. Uninstalled. Quick and easy download, install and activation. Unknown developer of obfuscated location. Weird off-putting EULA which unsuccessfully rewrites that belonging to an entirely different software last heard of back in Win95 days. The question inevitably arises as to if this offering is actually a re-badged product from a different developer. Tested on four different files, two of them originally prepared by the test computer, two of them commercial downloads from commercial websites. Of the two prepared on the test computer, the first -- a single page -- was converted with 100% accuracy but editing was a hassle due to the need to constantly re-size text boxes to prevent line bounce. The second document, of 14 pages, comprising a single image and two paras of text per page, defeated the software entirely: it found all the images but lost all the text (in both 'Easy Read' and 'Easy Edit' mode.) Of the two pdf files downloaded from commercial websites, conversion was 100% accurate but, again, editing a hassle. Text boxes needed re-sizing to contend with line bounce; boundaries often remained quirkily impervious to adjustment with the result that text finished up being written on top of existing text in unintelligible outcome. It was noticeable that in one pdf file -- of a 12-page brochure -- text editing resulted in entire lines whiting out, including text lines that had not been subject to revision anyway. The only way to determine if editing had been successful was to scroll further through the .doc then reverse to allow refreshing. As pdfs (most often in a commercial environment) can be marked up / edited with expensive Adobe software, the need for pdf to Word conversion is pretty minimal. At home, where such software is unlikely to figure in the average user's programs armory, then yes, there's a place for it. This software, however, though it impresses - generally -- with its conversion capabilities, didn't impress on test with post-conversion tasks. One caveat does need to be born in mind though: this kind of conversion work is considerably more complex than might appear on the surface. <b>The processes involved are capricious in that what they result in on one computer may not necessarily be what they result in on another:</b> a computer's individual configuration can affect the outcome. In my case, I need -- though very infrequently -- to convert a pdf file for the purposes of editing, not for the purposes of merely converting it, sitting back, and looking at it. On that basis then, thanks GOTD and thanks to today's developer, but this isn't for me. Uninstalled. MikeR, thank you for a full report. You describe my experience over a couple of decades with this entire genre of software. Of course, pdf text-only will convert pretty well in many of the offerings, but many PDF documents are hybrid or incorporate text boxes (objects) which are very problematical. By the time you untangle these you might as well re-type the document. I did find one package which is very good, but it works by ocr scanning and is pricey. MikeR, thank you for a full report. You describe my experience over a couple of decades with this entire genre of software. Of course, pdf text-only will convert pretty well in many of the offerings, but many PDF documents are hybrid or incorporate text boxes (objects) which are very problematical. By the time you untangle these you might as well re-type the document. I did find one package which is very good, but it works by ocr scanning and is pricey. Bruce, exactly my (long) experience, too. And seemingly borne out here, where the unpredictability / unreliability of this genre of software appears to vary so much from one user to another that there are posts reporting 100% success in post-conversion editing and others reporting no success at all. Ultimately, OCR is a key component -- as is the fact that for domestic usage, this type of app is largely irrelevant. Thanks for the invoice . With you're comments of 50/50 ..... .(sorta to me ). Ok ! .. . MikeR and Bruce ... Thanks for the invoice . With you're comments of 50/50 ..... .(sorta to me ). Hmmm .. Installed and ran great on 64-bit Windows 10. While this software worked great in converting the file format, the problem for me is that it converted the text to images rather than actual editable text. You can't go in and edit the text itself word or word. For this reason, this software doesn't do me much good. It's okay. My money wasn't spent and in vain and this may be really helpful to some. Maybe you want to upload a Word doc someplace and it's really best if the text can't be edited, you can save yourself the trouble of saving as a PDF...I dunno. I guess what I'm getting at is the software is good, it just doesn't fit my personal needs. Great share anyway, GAOTD! Installed and ran great on 64-bit Windows 10. Here I was moping that a couple weeks ago, I'd spent nearly $25 for a year's worth of PDF to Word conversions from Adobe itself... While this software worked great in converting the file format, the problem for me is that it converted the text to images rather than actual editable text. You can't go in and edit the text itself word or word. For this reason, this software doesn't do me much good. It's okay. My money wasn't spent and in vain and this may be really helpful to some. Maybe you want to upload a Word doc someplace and it's really best if the text can't be edited, you can save yourself the trouble of saving as a PDF...I dunno. I guess what I'm getting at is the software is good, it just doesn't fit my personal needs. Great share anyway, GAOTD! 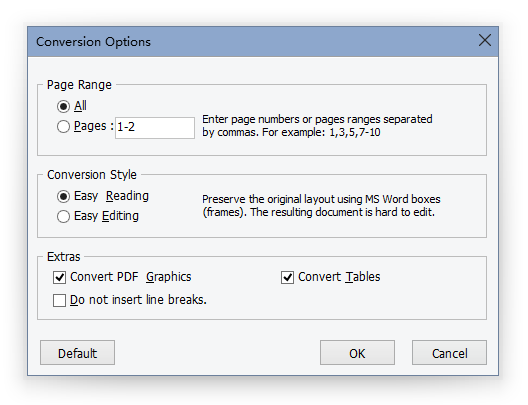 Would someone please advise what this does that Word can't - I can already auto-convert PDFs by opening in Word, and it creates tables not just text. DJ, I believe this program is able to perform a BATCH conversion. Exactly what I need to convert existing company policy documents and have department manager perform their updates. As for the table converted to text, I haven't run into that just yet. DJ, I believe this program is able to perform a BATCH conversion. Exactly what I need to convert existing company policy documents and have department manager perform their updates. As for the table converted to text, I haven't run into that just yet. Josef, thank you. It's rare I'd need to batch convert. I tried a more complicated document in Word - an airline ticket - and it wasn't too good. So I installed this program and... well, it's quite a bit better but still not usable without a lot of attention. In particular columns aren't created - it's done by tabbing across. Also some lines have compressed text spacing but it's random - one line is affected but another in the same paragraph isn't. I'll keep it for now. I love the phrase "The processes involved are capricious" made by MikeR! Josef, thank you. It's rare I'd need to batch convert. I tried a more complicated document in Word - an airline ticket - and it wasn't too good. So I installed this program and... well, it's quite a bit better but still not usable without a lot of attention. In particular columns aren't created - it's done by tabbing across. Also some lines have compressed text spacing but it's random - one line is affected but another in the same paragraph isn't. I'll keep it for now. I love the phrase "The processes involved are capricious" made by MikeR! Not work in LibreOffice 5, nice open with Word Viewer. Converted to Word - Yes. Document is NOT editable in Word. It is just an image in Word. Not very useful. Converted to Word - Yes. Document is NOT editable in Word. It is just an image in Word. Not very useful. PDF Converter Kit does not automatically recognize image content, because your PDF file is the picture, so can't edit after converted into PDF. Old Soldier, Thank you for your sharing. PDF Converter Kit does not automatically recognize image content, because your PDF file is the picture, so can't edit after converted into PDF. Thanks. Could it be that your source pdf was an image to begin with ? I have successfully converted pdfs to Word with that program. However, I suppose it needs a pdf as text in the first place. Old Soldier, Could it be that your source pdf was an image to begin with ? I have successfully converted pdfs to Word with that program. However, I suppose it needs a pdf as text in the first place. Downloaded and installed without any problems. tried converting a simple PDF to Doc and it worked like a charm. Thanks GOTD. Would have been nice if the "email survey link" actually resulted in an email to download the program to try. Don't often download stuff from gotd, now I recall why! Would have been nice if the "email survey link" actually resulted in an email to download the program to try. Don't often download stuff from gotd, now I recall why! Downloaded and installed on Windows 10 Home (64). Installation and registration was effortless and quick. I tried this out on a simple 1-page PDF that includes a table, and I was amazed at how fast the conversion took place. I have only one minor complaint: the table seems to have moved up on the converted page so that it appears to start underneath a previous item. Maybe it skipped a blank line. Not a real problem as I can now edit it in Word. Thanks Adept and GAOTD for making this available. Downloaded and installed on Windows 10 Home (64). Installation and registration was effortless and quick. I tried this out on a simple 1-page PDF that includes a table, and I was amazed at how fast the conversion took place. I have only one minor complaint: the table seems to have moved up on the converted page so that it appears to start underneath a previous item. Maybe it skipped a blank line. Not a real problem as I can now edit it in Word. Thanks Adept and GAOTD for making this available.